This piece of Brickercup and Blossutch fanart, which in turn is a part of BrickercupMasterX3’s Blossutch Month, is dedicated to Yoko Anime aka YokoAnimeProductions who celebrated her birthday two days ago. So, Yoko, I hope you had an amazing, lovely, awesome, and grand birthday. I wish you well in everything you are accomplishing as an artist and as a person. Lots of love and joy to you. Moreover, I would love to dedicate to all of the wonderful Brickercup and Blossutch shippers out there. Sit back, relax, enjoy and soak in that Brickercup and Blossutch sexiness and goodness. 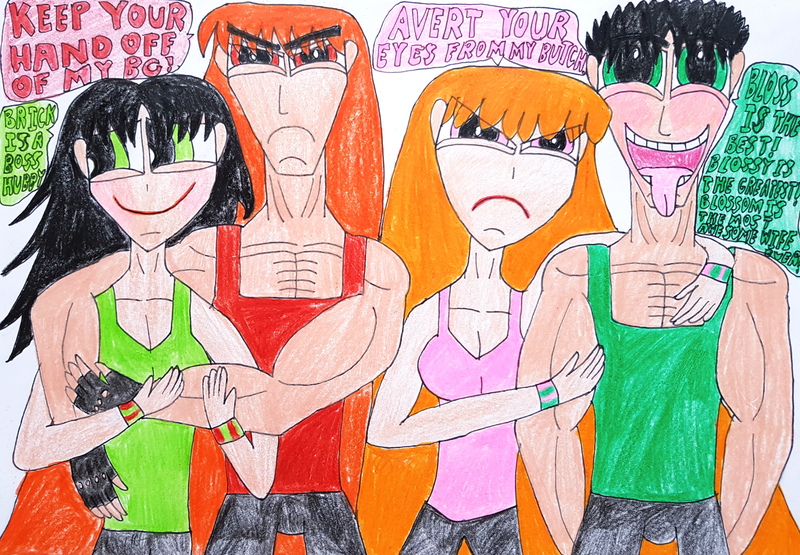 Here we have Team Xtreme’s red-clad Commanders and Leaders being the protective spouses that they are to the green-clad Toughest Fighters, who are acting like such sweet cinnamon rolls to them, what with Buttercup being subtle with her admiration for Brick and with Butch being not so subtle and acting like the lovable, fluffy pitbull that he is thanking the gods of love to have someone like Blossom in his life. One false move directed to Buttercup, Butch or both toughies and Brick, Blossom or both leaders would give the perpetrator a massive whooping. Brick the Bludgeoner cannot bear it when any pervert, psycho, mugger, murderer or sleazeball gets his grubby hands on his darling Buttercup. Anyone who dares touch her will automatically face the wrath of Brick through his masterful usage of pyrokinesis, thus giving the perpetrator a one-way ticket to the hospital or even worse…to Hell. Blossom the Commander and the Leader just cannot stand it when any hussy or douchebag get her or his way with her most beloved Butch the Baron of Berserk. Anyone who wants to have her or his way with him will have to come face to face with Blossom and her mad ice powers. Ergo, touch her husband and she will give you an attack in the form of a blizzard that one can never escape from. Where my headcanon is concerned for the Greens Butch and Buttercup, I decided to have a little fun with this. 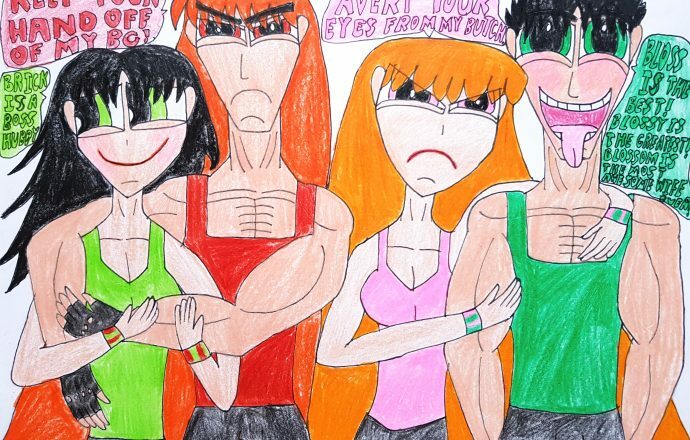 There is no doubt that Butch and Buttercup are Team Xtreme’s muscles and toughest fighters, thus constantly exposing their rough sides to any foe. However, when they are respectively in the company of Blossom and Brick, they act like the most obedient of dogs and sweetest of cinnamon rolls, thus showing their unconditional love, tenderness, and respect to them. Let’s also not forget that they very much outgrew their stubborn attitudes, but they are still rambunctious in their own ways, which in turn is passed down to their children. Brick and Blossom, being the Reds, wear the pants in their respective relationships, thus exuding dominance to their green-clad spouses and tenderness where they need it the most. Brick would always be the one to go out of his way to be the elegant, roguish charmer that he is to soothe Buttercup from her moodiness and temper tantrums. On the flipside, Blossom uses her smarts and unparalleled feminity to give Butch the taming, loving, and admiration he needs, thus making him very grateful to have a goddess of a wife like her in his crazy life. So, there you have it. When you have these red-clad, protective, and kind of possessive commanders and leaders being the dominant life partners to the green-clad, rough and hard on the outside sweet and fluffy on the inside, toughest fighters, you get relationships like Brickercup and Blossutch which are really fun, flexible, and interesting. Buttercup, Brick, Blossom, and Butch from The Powerpuff Girls belong to Craig McCracken and Cartoon Network.